After a fragment of hopeful symbolism outside the airport terminal I stumbled across this in a shop inside. Ironically, in the Deutsches Museum shop which was otherwise filled with cool, educational toys. Rush Hour! 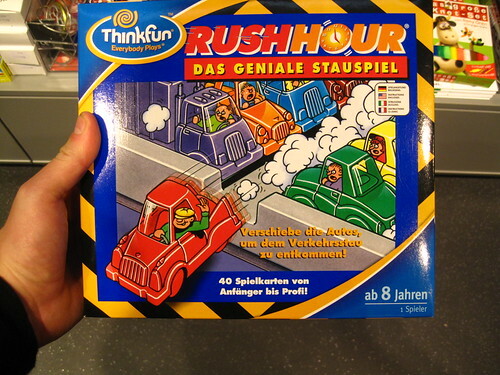 The brilliant traffic jam game! Move the cars to escape the traffic jam! And, by the looks of it, learn how to piss off everyone else in the traffic jam. But hey... as long as you get home first, who cares. Think Fun, out of the States, is the manufacturer and you can order your game online! Buy now! Operators are standing by. Se habla espanol. Teach your kids the important stuff in life.